This past weekend, DNAdigest organized a Symposium on the topic “Open Science in human genomics research – challenges and inspirations”. The event brought together very interested in the topic and enthusiastic people along with the DNAdigest team. We are very pleased to say that this day turned out to be a success, where both participants and organizers enjoyed the amazing talks of our speaker and the discussion sessions. The day started with a short introduction on the topic by Fiona Nielsen. Then our first speaker, Manuel Corpas was a source of inspiration to all participants, talking us through the process he experienced in order to fully sequence the whole genomes of his family and himself and to share this data widely with the whole world. Here is a link to the presentation he introduced on the day. 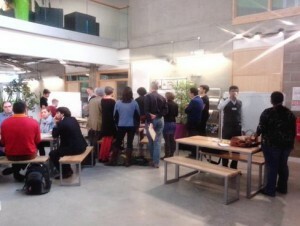 The Symposium was organized in the format of Open Space conference, where everybody got to suggest different topics related to Open Science or choose to join one which sounds most interesting. Again, we used HackPad to take notes and interesting thoughts throughout the discussions. You can take a look at it here. We had three more speakers invited to our Symposium: Tim Hubbard (slides) talked about how Genomics England gets to engaged the research community, in the face of genomic scientists and patient communities, to collaborate on both data generation and data analysis of the 100k Genomes Project for the public benefit. Julia Wilson (slides) came as a representative of the Global Alliance. She introduced us to the GA4GH and explained how their work helps to implement standards for data sharing across genomics and health. Last, but not least was Nick Sireau (slides). 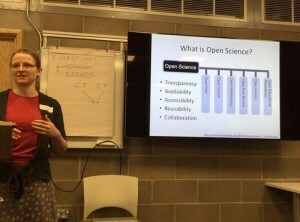 He walked us through an eight-step process to show us how exactly the scientific community and the patient community can engage in collaborations, and how Open Science (sharing of hypotheses, methods and results, throughout the science process) may be either beneficial or challenging in this context. The event came to its end with a summary of learning points and a rounding up by Fiona Nielsen. We have also made a storify summary where you can find a collection of all the tweets and most of the photos covering the duration of the day. Also there is a gallery including all pictures taken by our team members. Now to all former and future participants, If you enjoy participating in these events please donate to DNAdigest by texting DNAD14 £10 to 70070, so that we can continue organizing more of these interactive and exciting events in the future. You can also buy some of our cool DNAdigest T-shirts and Mugs from our website shop. 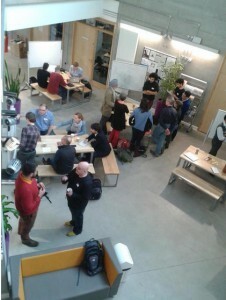 It was great to see you all, and we look forward to welcoming you again for our next events!